Who is a Building Tomorrow Fellow? It is often said that it is someone who makes impossible things possible, ignites social change to transform rural communities, and champions the child in all that they do. They come in many shapes and forms and from every corner of the country. And if you talked to one of them on the streets, you might recognize a certain restlessness about them, a glint of idealism behind their eyes that sees the world as it could be, rather than as it is. But what defines a Fellow is not where they come from or even the vision itself of how they see the world. It’s their hands—their hands that organized the first girls’ marathon for education in Lyantonde District, brought over 500 girls onto a soccer field for the first time in the Kiboga Girls Soccer Tournament, and reached out to the most vulnerable rural communities in Uganda to start a savings and loan movement through Kisoboka Africa. It’s the actions they take to turn their ideals and dreams into plans. It’s the way they move mountains and turn the glint behind their eyes into a glimmer of hope and opportunity for those who need it most. They are resource mobilizers. Whether they’re moving people, funds, or mindsets, they’re making change happen and shaking things up. One of these crusaders of change is Brian Ssekajja. Having stepped onto the scene with Building Tomorrow’s Thriving Schools Program to fan the flames of his passion of creating change in hard-to-reach communities and himself, Brian started working with four schools in the dusty Buyende District of Eastern Uganda in March 2018. One of these schools was Kigeizere Primary School. 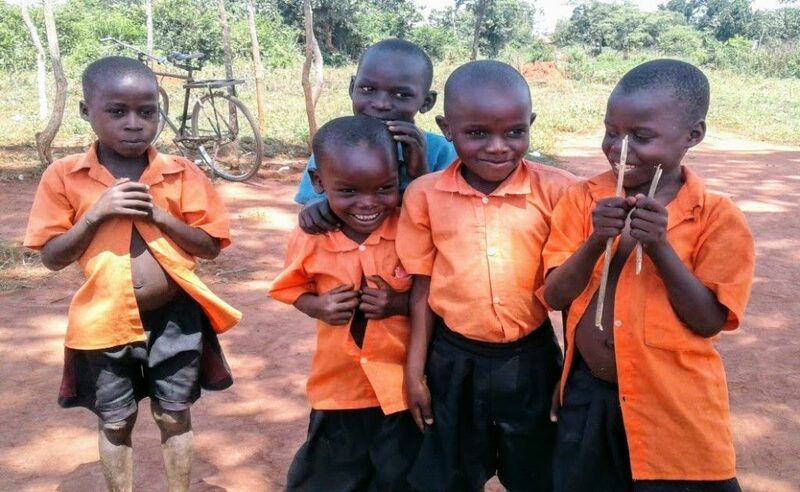 Like many schools confronting the influx of children since the advent of free basic Universal Primary Education in a country with the world’s youngest population, Kigeizere was overcrowded. 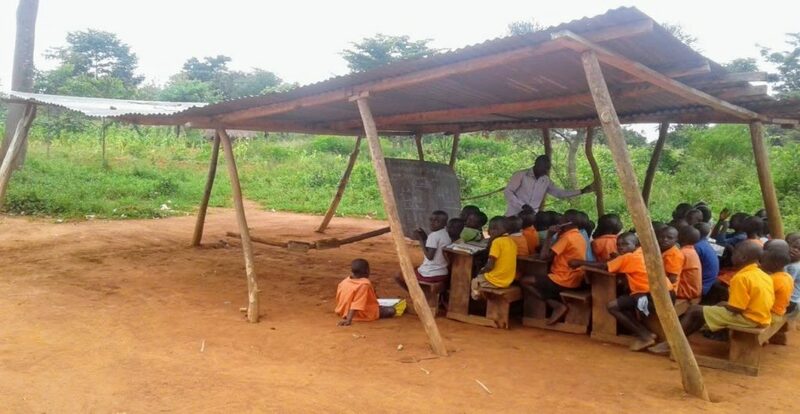 Five of its eight classes took place outside, under makeshift temporary structures that threatened to cave in and provided no shelter against the rains that characterize Uganda’s tropical climate for 6 months of the year. Students sit underneath an unsafe temporary structure due to severe overcrowding at Kigeizere Primary School. Even the three classes lucky enough to be accommodated under the adjacent properly-constructed building could not escape the school’s challenges, as their rooms came to a standstill whenever rains began to deluge from the sky and the outside five classes would run and seek shelter there. Managing day-by-day and clinging to a promise by the government for the past five years to add buildings to the school, learning outcomes suffered. Enter Building Tomorrow Fellow Brian Ssekajja, his community education volunteers (CEVs), and the head teacher of Kigeizere Primary School. Seeing the way that the school was suffering and determined to take action, the group set forth doing what Building Tomorrow Fellows do best—mobilizing. At the local level, the group secured commitments from community members to repair the crumbling temporary classrooms and provide cheap labour if resources became available to initiate the construction of a permanent structure. Meanwhile, at the district level, the Fellow, head teacher, and CEVs pulled all their clout to lobby the district education officer (DEO) to fulfil his long-standing commitment of providing at least one more classroom block for the school. And at the sub-county level, the team arduously advocated for much-needed classroom furniture to secure 35 desks for the school’s students, most of whom are forced to write from their laps. Filled with new energy, the community managed to put up three additional temporary classrooms to help with overcrowding while lobbying efforts for permanent structures continued. Then, one morning, following months of relentless determination to have the community’s needs heard, the sound of shovels scraping rocks and piles of dirt as high as their hopes filled the compound. The district had come through on its commitment, and the construction of a new four-classroom block had begun. Construction begins on a new four-classroom block at Kigeizere Primary School. Due in no small part to the support of the community, the classroom block is now complete and can accommodate up to 300 children. 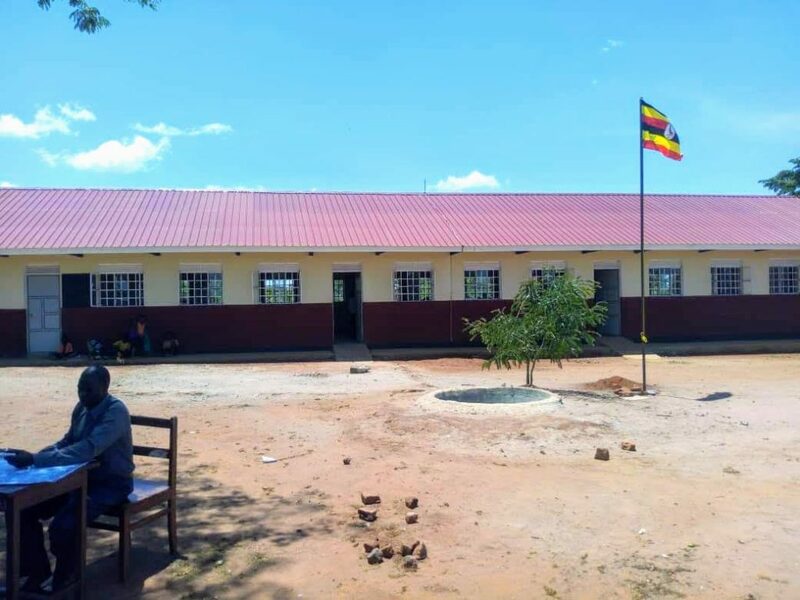 The four classrooms of the newly constructed classroom block at Kigeizere Primary School can accommodate up to 300 pupils. Far from having its overcrowding woes solved, the school still needs additional classroom space, and the Fellow, school stakeholders, and community continue to push for additional resources. However, for the 300 children who now sit within the walls and roof of the new structure, their learning experience has been transformed. And for the community that that had all but given up hope in transforming its school, the success has reinvigorated enthusiasm for learning and brought out-of-school children back from the villages and into class. Formerly out-of-school children cheerfully come back to class at Kigeizere Primary School, following the set-up of additional temporary and permanent structures to accommodate them. Brian is one of 100 Building Tomorrow Fellows in the field currently lending their voices, hands, relentless determination, and creative ingenuity towards building a better future for Uganda’s children. To find out more about our Thriving Schools Program, click here.